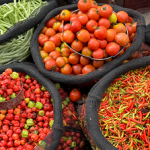 Over the past three years the Kenyan Horticulture and Food Security Program (HFSP) has aimed to provide smallholder farmers access to quality seeds, to offer training in good agricultural practices and to improve linkages to markets. ‘The program has helped farmers to come and work together; we can now control the prices as well as work as a team. We have been able to reach out to the women who are not able to access the market’, says Rose Muema, a farmer from Makueni Cooperative Society. 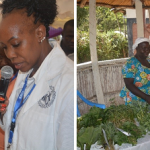 Solidaridad (Lead), SNV and Hivos were responsible for the implementation of the program and AgriProFocus took the lead in the knowledge management. HFSP was funded by The Embassy of the Kingdom of the Netherlands, which sees it as a pioneer program in combining trade and development in the area of agriculture and food security. 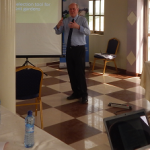 The forum saw 80 participants drawn from development agencies, government and private sector. ‘With this partnership, we were able to train farmers and they took ownership, stopped expecting funds and started looking for ways to generate income. ’ added Stephen Wachira, a director at Wamu Investment. Wamu Investment was one of the horticultural exporting companies that partnered in the program. Now that the first phase of the HFSP has been concluded, a new phase will commence in April 2015. This new phase will seek to scale up and scale out, based on the experiences of the first phase. The lessons learned from the HFSP will of course be incorporated in this new phase, which will increasingly link to Dutch knowledge and expertise. A video on the HFSP-program can be watched here. Your Contribution…I appreciate what you have been doing and I would like to be part of the program. In the meantime, the F&BKP Office has established a contact between the author of this comment and the Kenyan Horticultural programme.